‘Heartbeat' was created in December 2018, the result of a five-day Desert Pea Media storytelling workshop. 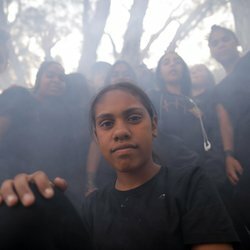 Co-written by, and starring, an incredibly talented group of young people, community members and local Elders from the local community - with support from the DPM team and Wilcannia High School Staff. The DPM team feels deeply honored to learn, share, create and build friendships and connection with the Barkindji community in Wilcannia. These projects not only uplift and inspire audiences and community members, but everybody involved. These are friendships and experiences that are deeply valued and respected. This project featured the musical direction and production of acclaimed music producer Carlo Santone (Blue King Brown/Nattali Rize). We thank you brother for you artistic vision and awesome work.